Mr. Gandhi slighted at R-Day parade? HomePoliticsMr. Gandhi slighted at R-Day parade? 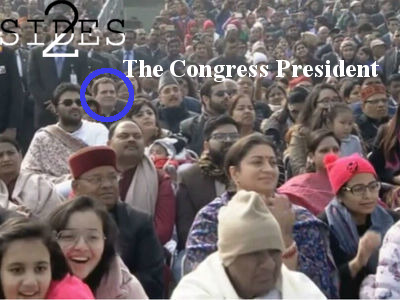 The 47-year-old Congress president, Mr Rahul Gandhi, was seated in the sixth row for the Republic Day parade, along with Leader of Opposition in the Rajya Sabha Ghulam Nabi Azad. Initially, Mr Gandhi was allotted a seat in the fourth row but then it was shifted to the sixth row. Amit Shah, the president of the ruling BJP, was in the front row along with senior leader LK Advani. As the controversy erupted, Congress lashed out at the BJP and Prime Minister Narendra Modi, saying the move was a departure from the tradition. They said Congress presidents in the past were given the front row seat since independence, including Sonia Gandhi, who as the party chief has always been given a seat in the front row. The Congress leader alleged that by doing so the Modi government was resorting to "cheap politics". Another Congress leader said the move was aimed at "humiliating" the Congress leadership at the public function that will be attended by head of governments/states of all the 10 ASEAN countries. Congress says the leader of the opposition was always allotted a seat in the front row for the parade. Under UPA, L K Advani was allotted a seat in the front row when he was the leader of the opposition, the party said. Defence ministry officials clarified that a special dispensation that gave Sonia Gandhi a front-row seat had not been extended to the new Congress president. Defence ministry sources said there was no violation of protocol set out by the warrant of precedence, which was clear that leaders of political parties come down the order. Even the leader of the opposition (LoP) is placed seventh on the list, behind several dignitaries, and at present, there is no LoP in the Lok Sabha due to a lack of numbers. The official reason cited for Rahul’s sixth-row seating is due to R Day parade witnessing an unprecedented ten heads of state attending the grand celebrations.